Windows 7 is currently the most popular operating system, with about 68% of PCs worldwide using this OS! But did you know it’s currently past “mainstream” support? As a Windows program, SolidWorks will discontinue support for that operating system, so as you’re choosing new systems keep that in mind! *Support for Windows 7 pre-service pack 1 ended on April 9, 2013. Be sure to install Windows 7 Service Pack 1 to continue to receive support and updates. So what does this mean to SolidWorks users? Customers running 8.1 should plan on migrating to Windows 10 to install SOLIDWORKS 2019 or newer. 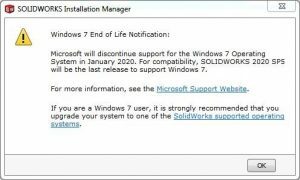 Windows 7 will need to migrate if installing SolidWorks 2021 or newer. And be sure to stay up-to-date with all the system requirements.